Natick, Mass., July 18, 2017 – RCS Learning Center today announced it received a $18,389.00 grant awarded by the Middlesex Savings Charitable Foundation for the 2018 fiscal year. The support will allow RCS Learning Center to provide 1 to 1 access to technology for each student. Thus, ensuring the appropriate technological advances are available to every student to support their academic, vocational, and daily living needs. RCS Learning Center will be adding iPads, supporting software programs, educational applications, and protective cases to provide the 1 to 1 access to technology that will allow for an increase in effectiveness of providing the highest quality of individualized programming for each student. RCS Learning Center is a nonprofit organization serving families and 26 school districts within Massachusetts providing the highest quality of individualized behavioral and educational research and services for children with Autism Spectrum Disorder and other developmental disabilities. RCS Learning Center prides itself in the unique qualities of the educational & behavioral services provided and with a vision to remain the leader with intensive and individualized programming in a 1:1 staff to student ratio. The implementation of a 1 to 1 technology program supports this goal. Local residents can see how the Middlesex Savings Charitable Foundation grant and local funds are benefiting the RCS Learning Center by visiting us at www.rcslearning.org. The Foundation was established in 2000 to carry out further the philanthropic mission of Middlesex Savings Bank by supporting the communities served by the Bank. Since its creation, the Foundation has provided more than $4 million in grants to over 400 nonprofit organizations, supporting services, and programs in a wide variety of fields, including education, and basic human services. Since the inception of the Foundation, Middlesex Savings Bank has funded the endowment with over $15 million in contributions. More information available at https://www.middlesexbank.com/community-and-us/community-support/Pages/charitable-foundation.aspx. Middlesex Savings Bank, founded in 1835 and headquartered in Natick, Mass., is a mutual savings bank. As one of the largest independent banks in Massachusetts with assets exceeding $4 billion, the bank has been committed to providing outstanding value in consumer banking and business banking products for 180 years. The FDIC and DIF insured bank has 30 branch offices located in 24 communities – Acton, Ashland, Bedford, Bellingham, Boxborough, Concord, Framingham, Franklin, Groton, Holliston, Hopkinton, Littleton, Maynard, Medfield, Medway, Millis, Natick, Needham, Sherborn, Southborough, Sudbury, Walpole, Wayland, Wellesley, an Westford. For more information, please visit www.middlesexbank.com, www.facebook.com/connectwithmsb and www.twitter.com/middlesexbank. RCS Behavioral & Educational Consulting’s Early Childhood Division is Growing Quickly! RCS Behavioral & Educational Consulting’s Early Childhood Division has recently expanded their office space in Woburn, MA. RCS originally acquired office space in Woburn to accommodate the growing needs of their newest division, the Early Childhood division. Since moving into the office, the division has nearly doubled the number of children and families they support making it necessary to move into a larger space. Thanks to the flexibility of Cummings Property, RCS was able to remain in the same building and relocate to a larger office down the hall. Founded in 1997 by Louis Ranieri and Denise Rizzo, RCS Behavioral & Educational Consulting provides highly individualized educational and behavioral services to children with Autism and other developmental disabilities from birth through the age of 22. The company supports children and youth in their home and school environments to help each child develop important skills to reach their full potential. RCS’ Early Childhood division, founded in June 2014, focuses on delivering services to children from birth through 6 years of age through the Rising Stars Integrated Preschool Program in Natick, Early Intervention services in the North Shore region, and traditional in-home and in-school consulting services through districts and insurance. The Early Childhood Clinical Team is comprised of Board Certified Behavior Analysts and Behavior Therapists with expertise working with young children and is led by Director of Early Childhood Programs, Allison Genovese and Clinical Director, Tiffany Szymanski. “It has been really rewarding to watch RCS grow as much as we have over the past few years,” said Co-Founder and President, Denise Rizzo. “Upsizing the Woburn office is another step that will allow us to continue to provide the best services possible to children with Autism Spectrum Disorder and other developmental disabilities. The new office provides ample space to accommodate our ever growing team of exceptional clinicians and supervisors. This space will be used for weekly staff trainings, offices for our administrative team and planning space for our staff. RCS’ new office is still located at the Cummings Properties’ 10 Tower Office Park in Woburn. Exponent Engineering and Scientific Consulting, generously donated desks and file cabinets to help fill the new space. Exponent is a leading engineering and scientific consulting firm that provides solutions to complex technical problems. They are located in Natick, MA on Strathmore Road right across from RCS Behavioral and Educational Consulting’s sister company RCS Learning Center, a non-profit school for children with Autism. Visit RCS Behavioral & Educational Consulting at www.RCSconsultingNE.com or call 508-650-5990 for more information. FRAMINGHAM, MA, June 23, 2015 –RCS Behavioral and Educational Consulting is continuing their expansion by adding a new office location in Framingham, MA at 929 Worcester Rd. RCS is thrilled to continue to meet the increasing needs of children with autism. Having just recently added office space in Woburn, MA the acquisition makes this the second facility added in the last 4 months. Founded in 1997 by Louis Ranieri and Denise Rizzo, RCS Behavioral & Educational Consulting provides highly individualized educational and behavioral services to children with Autism and other developmental disabilities from birth through the age of 22. The company supports children and youth in their home and school environments to help each child develop important skills to reach their full potential. Since 1997 RCS has grown to a multi-faceted organization that has successfully served over 1,000 individuals. RCS hopes to be fully moved in by the beginning of July. For more information go to www.RCSconsultingNE.com or call 508-650-5990. NATICK, MA April 15, 2015 – On April 13, 2015, the Framingham Union Aid Association (FUAA) grants $1,500 to RCS Learning Center, for the third year in a row. This year, their donation will help RCS purchase additional supplies needed in the Nurse’s office. The FUAA was founded in 1892, by a group of individuals who volunteered to perform various tasks at the Framingham Union hospital. Since then, the FUAA has been a Non-Profit Organization that serves the Metrowest towns of Ashland, Framingham, Holliston, Hopkinton, Marlborough, Medway, Millis, Natick, Sherborn, Southborough, Sudbury, and Wayland. It is the mission of the FUAA to help aid health-related projects in the Metrowest area. Approximately 30 grants are awarded per year, more than $1.25 million dollars. RCS Learning Center happened to be fortunate enough to receive one of these grants. “We are extremely grateful to have been the recipient of this grant for the third time and that the Framingham Union Aid Association continues to support our mission and be so involved in our community,” said Jennifer Rutland, a member of the Executive Team at RCS Learning Center. “In addition to Autism, many of our students have a variety of complex diagnoses ranging from diabetes to seizure disorders. This grant has helped RCS purchase an AED as well as additional manikins to be used for our state mandated CPR and First Aid trainings. The safety and health of our students is our highest priority and it brings a great deal of comfort knowing we have the additional resources available to continue to provide high quality trainings to all of our staff, so they have the skills and resources necessary in the event of a medical emergency,” said Jennifer. Thank you to the FUAA for your continued investment in our organization and our kids. Realizing Children’s Strengths (RCS) Learning Center is a not-for-profit organization whose mission is to provide the highest quality of individualized behavioral and educational services for children with Autism Spectrum Disorder and other developmental disabilities. We believe that every child has unique skills and we are dedicated to helping each child develop these skills and reach their full potential. RCS Learning Center is proud to announce that our 2014 Holiday Appeal raised $10,020 this year to benefit our organization! Thanks to the support of over 60 donors, we were able to reach and exceed our goal of raising $10,000 to support the “Let’s Get to Work” Vocational Program! Please see below for a list of donors who gave $100 or more to our Holiday Appeal this year. Your donation is helping us purchase a school van to transport students to a variety of job opportunities in our communities. Your donation is allowing our students to begin earning wages for the great work they do here at RCS and out in the community. Your donation is supporting RCS’ ability to spread awareness and acceptance in our communities by simply allowing our students to share with everyone how amazing they truly are. Most importantly, your donation is helping to make sure RCS students don’t become part of the above statistics, but instead create a new trend of having young adults and adults with autism working alongside all of us at our jobs. We thank you for supporting our organization and we look forward to sharing more ways your donation is making a difference here at RCS during the coming months! Middlesex Savings Charitable Foundation, the nonprofit, private charitable foundation established to further carry out the philanthropic mission of Middlesex Savings Bank, recently awarded a grant in the amount of $11,675 to Natick-based nonprofit private day school, RCS Learning Center. The funds will help support the organization’s “Let’s Get to Work” Vocational Program, a specialized experience-based program providing students ages 14-22 the opportunity to explore and develop important job related skills to become quality members of our communities. To see photos from Middlesex Savings Charitable Foundation’s visit to the RCS School Store, visit our Facebook page! Realizing Children’s Strengths (RCS) Learning Center is a not-for-profit organization whose mission is to provide the highest quality of individualized behavioral and educational services for children with Autism Spectrum Disorder and other developmental disabilities. We believe that every child has unique skills and we are dedicated to helping each child develop these skills and reach their full potential. Started in 2006, the Natick-based Chapter 766 approved private school serves over 40 children ages 3-22 with Autism and other developmental disabilities from over 30 towns and cities in Massachusetts. The Foundation was established in 2000 to carry out further the philanthropic mission of Middlesex Savings Bank by supporting the communities served by the Bank. Over the past 13 years, the Foundation has provided more than $2 million in grants to over 200 nonprofit organizations, supporting services, and programs in a wide variety of fields, including education, and basic human services. Since the inception of the Foundation, Middlesex Savings Bank has funded the endowment with over $11 million in contributions. Middlesex Savings Bank, founded in 1835 and headquartered in Natick, Mass., is a mutual savings bank. As one of the largest independent banks in Massachusetts with assets exceeding $4 billion, the bank has been committed to providing outstanding value in consumer banking and business banking products for over 175 years. The FDIC and DIF insured bank has 29 branch offices located in 23 communities – Acton, Ashland, Bedford, Bellingham, Boxborough, Concord, Framingham, Franklin, Groton, Holliston, Hopkinton, Littleton, Maynard, Medfield, Medway, Millis, Natick, Needham, Southborough, Sudbury, Wayland, Wellesley, and Westford. This Spring, many staff members celebrated as their hard work paid off! We want to take a minute to congratulate everyone on their recent accomplishments! Our first Cohort of Simmons College students graduated with their Master’s In Behavior Analysis in May. Congratulations! We also had members of our administration present research at the Massachusetts Applied Behavior Analysis Annual Conference in April, the MAAPS Annual Conference in May, and the Applied Behavior Analysis International Annual Conference in Chicago in May.Congratulations to Christina Boyd-Pickard, Colleen Yorlets, Liz Kelsey, Meg Breault, and Stacee Hansen! To learn more about our staff and their qualifications, click here. $8,500 Raised at 2nd Annual “A Toast to Progress”! 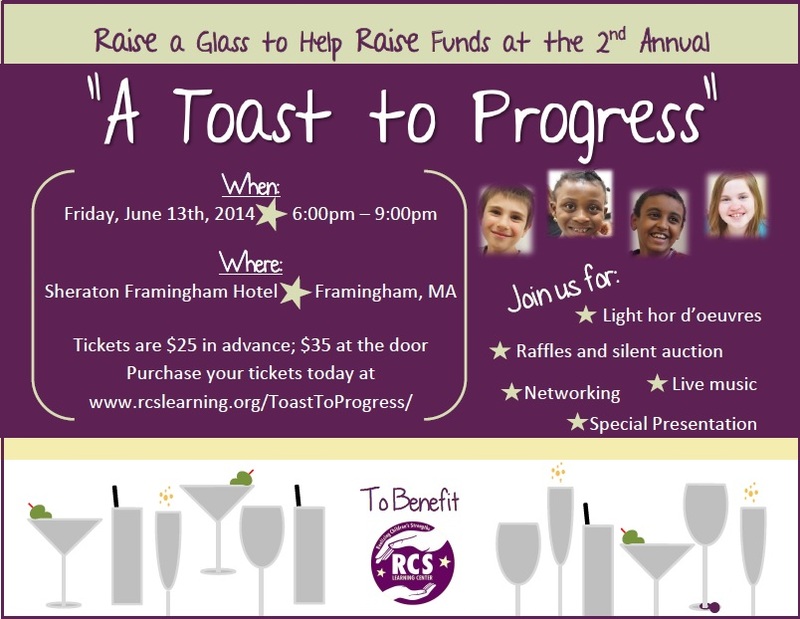 On Friday, June 13th, RCS Learning Center hosted their 2nd Annual “A Toast to Progress” at the Sheraton Framingham Hotel and Conference Center. The evening focused on sharing RCS’ important mission and the progress our students continue to make at the non-profit school. With over 100 staff members, parents, donors, and community members in the room, the event successfully raised $8,500 to benefit the organization’s “Let’s Get to Work” Vocational Program. Guests in attendance enjoyed live music, a raffle featuring prizes such as Vineyard Vines ties, gift certificates to local restaurants and cultural institutions, and custom jewelry, and a silent auction, with popular items including a private wine tasting for 10 at Westport Rivers Winery with transportation from Accent Limo. The evening could not have been such a success without the generosity of our sponsors. Thanks to our Video & Entertainment Sponsors: R.W Holmes Realty Co. and Telamon Insurance and Financial Network, our Hospitality Sponsors: Align Credit Union, Eastern Bank, Mini-Miracles Child Care Center, and RCS Behavioral & Educational Consulting, and our Champagne Toast Sponsor: The George Family. To see photos from the evening, please visit our Facebook page. Unable to join us? You can still help us celebrate by making a tax-deductible donation to RCS Learning Center. You can send a check to 6 Strathmore Road, Natick, MA 01760 or make an online donation today! RCS Learning Center’s 6th Annual Fall Festival was another great success this year! Thanks to everyone’s support, we raised $2,000 to help purchase materials for our RCS School Store as part of our “Let’s Get to Work” Vocational Program. The weather was perfect and we had a lot of families and friends join us to celebrate and enjoy an afternoon of fun. Please visit our Facebook page for photos from the event! We hope you can all join us next year for another wonderful festival! RCS 5 for Good, Channel 5 News Segment!